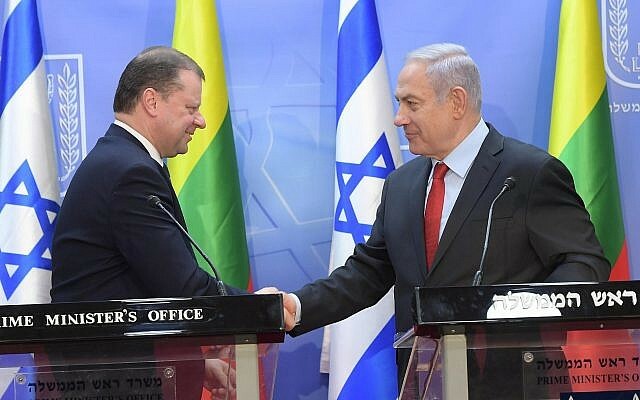 VILNIUS, Lithuania — Center-right Prime Minister Saulius Skvernelis said Tuesday he would consider moving Lithuania’s embassy in Israel from Tel Aviv to Jerusalem, should he win May’s presidential elections. Skvernelis said that moving the mission could lead to closer ties with Israel and the United States, which Lithuania sees as a key security buffer against Russia. The embassy transfer “could bring new impetus for relations with Israel, both in the areas of security and trade,” Skvernelis told reporters as he hit the presidential campaign trail to outline his foreign policy priorities. “We would also send a signal that the United States is our partner not only in words but that we also side with it in bitter questions under discussions,” he added. “The official Lithuanian position has not changed: Jerusalem’s status must be solved through negotiations and both sides should refrain from unilateral actions and decisions,” the minister told AFP. By law, moving the embassy would require the approval of both the government and the president. Israel’s Foreign Ministry declined to comment on Skvernelis’s statement, when contacted by The Times of Israel. President Donald Trump’s decision to move the US embassy to Jerusalem — applauded by Israel — broke with decades of international consensus that the city’s status should be settled as part of a two-state peace deal between Israel and the Palestinians, who also claim it as the capital of their future state. Senior politicians in fellow EU states Czech Republic and Romania have said they are also considered moving their embassies to Jerusalem but no decisions have been taken to this date. The EU as a whole holds the position that Jerusalem’s status must be negotiated by Israel and the Palestinians. Israel captured East Jerusalem in the 1967 Six Day War and later annexed it in a move never recognized by the international community. 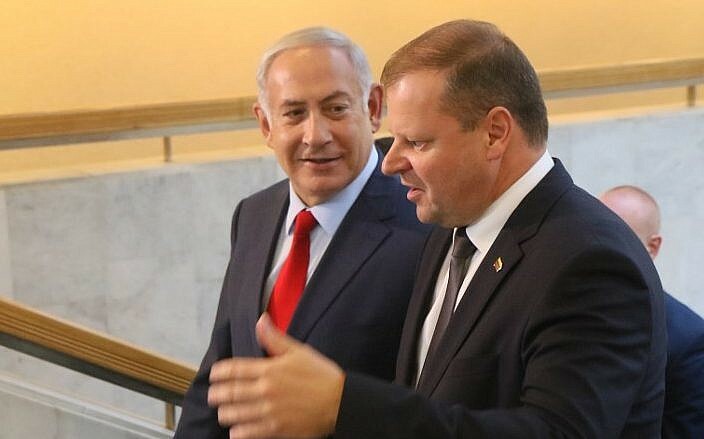 Skvernelis insisted on Tuesday that his nation “must not be afraid to differ from neighboring states,” saying cultural and security links made Israel one of Lithuania’s closest allies. The legacy of the Holocaust and close alignment with the US are among the reasons why Lithuania has become one of Israel’s closest friends within the EU over the last decade. Outgoing president Dalia Grybauskaite, who after two consecutive terms is not running for re-election, “would not comment on election programs,” her spokeswoman said. Lithuania will hold a two-round presidential election on May 12 and 26. In recent opinion polls, Skvernelis was trailing independent economist Gitanas Nauseda and conservative ex-finance minister Ingrida Simonyte.